With the RealBird SMS Marketing Platform you can set up a dedicated SMS phone number and assign text codes to your mobile property websites. Prospective home buyers can inquire about any of your properties by simply sending that text code to your number. 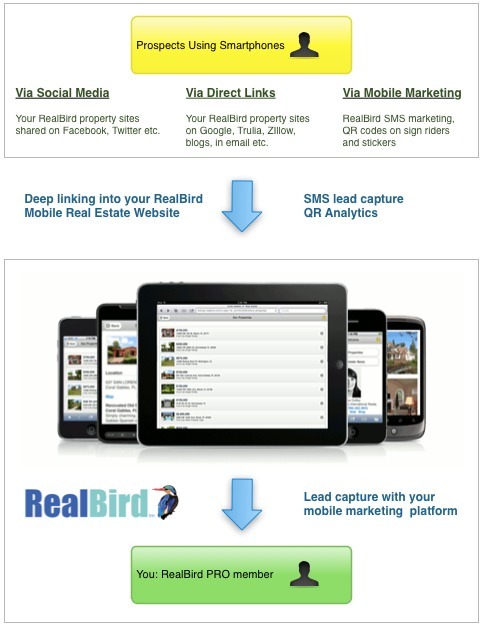 RealBird captures the prospect's phone number for you and notifies you immediatly. Once you set up your Twilio phone number and configured it with the RealBird platform as described in this tutorial, you are all set. Just post your call-to-action message on your sign riders, flyers or using the RealBird SMS sticker and we'll take care of the rest, including providing mobile phone optimized property information for your prospects and capturing the leads for you. The RealBird property websites have automatically assigned text codes by default, but you can assign a custom code to your property and transfer it to another one later. Save big by reusing sign riders.